Action from a Thorney FC game at Campbell Drive. 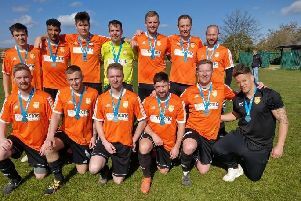 An end-of-season cup final appearance at the ABAX Stadium would be the perfect reward for the loyal folk battling against the odds to keep Thorney FC alive. The village club are tenants on a Campbell Drive ground 10 miles from home which doesn’t sound a big issue until manager Tom Florence tells you his matchday routine. “We play in Gunthorpe as we’re still waiting for Thorney Park to be made ready for use again,” Florence said. “That means at 11am on the day of a game with a 2pm kick off, me and a couple of volunteers pick up goalnets and portable dugouts from a garage in Eye, drive them to Campbell Drive, hang the nets on the goal frame and assemble the dugouts. “Then we put the rope around the playing surface which is another Premier Division requirement and then get the players ready. “It’s a tiring day, but we are determined to do what we have to, to keep the club going ready for a return to Thorney. “Gunthorpe Harriers play at the same ground and asked us to play under their banner, but we won’t let Thorney FC die. It’s a tough situation because progress at our ground in the village has been so slow. “It’s a relief when the match starts to be honest. Trust me pople involved in clubs like Netherton don’t know how lucky they are! Thorney start their Senior Cup campaign at home to Division One side Oundle Town tomorrow (October 14, 2pm). Leon Gellizeau, who moved from reigning Premier Division champions Peterborough Sports Reserves in the close season, scored twice last weekend in a 6-2 win over Holbeach United Reserves when Adam Scott also claimed his 11th goal of the campaign. Goalkeeper Ben Derbyshire and midfielder Liam Merryweather also moved across from Sports Reserves to Thorney in the close seaso. Scott was a Netherton regular last season. Pick of the Premier Division matches tomorrow sees sixth-placed Sawtry host bang-in-form reigning champions Peterborough Sports Reserves who have moved up to third place. Leaders Moulton Harrox host bottom club Langtoft United, second-placed Stamford Lions are at Sutton Bridge, while fourth-placed Netherton United entertain Deeping Reserves. There are four PFA Senior Cup ties this Saturday headlined by an all Premier Division tie between Holbeach United Reserves and AFC Stanground Sports. First round: Holbeach United Res v AFC Stanground Sports, Thorney v Oundle Town, Uppingham Town v Ketton, Crowland Town v Long Sutton Athletic. CAMBS CHALLENGE CUP: Leverington Sports v Sawston United, Whittlesey Athletic v Comberton United. Premier Division: Moulton Harrox v Langtoft Utd, Netherton United v Deeping Rangers Res, Sawtry v Peterborough Sports Res. Sutton Bridge United v Stamford Lions, Warboys Town v ICA Sports.